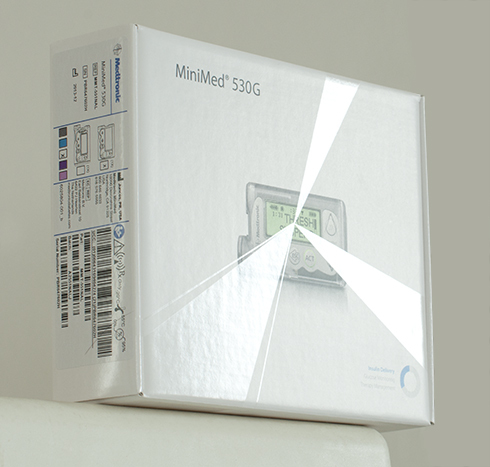 “New look for infusion set and reservoir boxes is coming soon. Your favorite infusion sets and reservoir boxes are getting a new look. 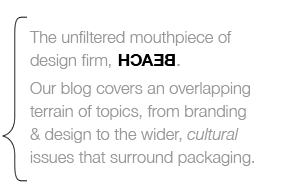 In other words: only the branding has changed. The look of the consumables is now consistent and coordinated to match the recent Apple-style packaging of MiniMed’s 530G insulin pump (on left). 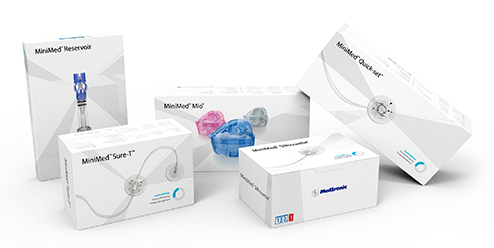 All of the boxes feature clean, silhouetted product photos against a white background with an asymmetrical graphic “burst” to symbolize MiniMed’s wireless CGM (continuous glucose monitoring) system. Where the extra cost of the subtle spot varnish “wireless burst” graphic might have seemed warranted for a “durable” product, the consumables packaging must make do with a light gray tint for their wireless bursts.